This exhibition celebrates the 150th anniversary of the French exploration and research in Lao, especially in southern Laos. Dinan is the town where Auguste Pavie was born. 20 years ago, the City of Dinan commemorate the 150 anniversary of his birth. 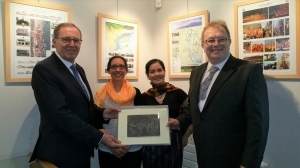 This year (2017), in order to celebrate also 20 years of cooperation beetwen Champasak and Dinan, this exhibition is organised to enhance the close collaboration with France and Laos about the Vat Phou heritage and its surrondings.